CANCELLED. Due to the unpredictable snow and lack of parking this event has been cancelled. Out of respect to the Worthington Highway Department we are going to keep the road clear during the storm. Come see this beautiful pair, Rock and Star, work with Tom to move large logs with ease! This event is family friendly with activities for kids being offered while the Q&A is in session. 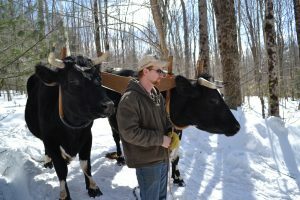 The demonstration will take place on a private property that has recently undergone a timber harvest by Tom and his team of oxen. Participants should expect to be outside for the duration of the talk and be able to walk through the woods in variable snow conditions on uneven terrain. Please dress warmly!